When ardent students of mosses or bryologists traverse the globe to come to Tasmania, they will have, among the top candidates of their ‘to-see’ list, an `endemic Tasmanian moss. This is none other than Pleurophascum grandiglobum. Rest assured that this moss lives up to it’s grandiose name. As this moss is so distinctive and significant, I’ll take the liberty to call it the Globe Moss, a name that I will use henceforth. The Globe moss appears to be largely restricted to Buttongrass sedgeland habitats in the western part of the state. In a sterile state, the leaves are beautifully and symmetrically arranged around the stem and from the top look like the way lotus petals are arranged around their flower axis. The leaves are almost cup-like, lack nerves, but usually, although not always, have a single hairpoint at the apex. These characters, with the additional habitatual context, renders the Globe moss difficult to mistake for anything else. 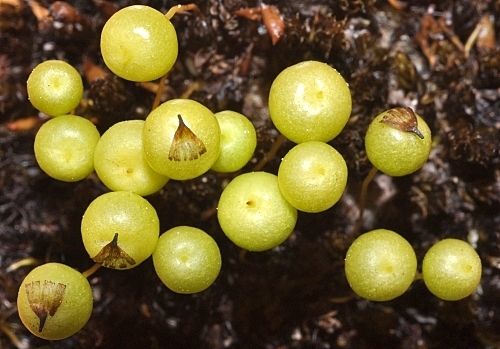 When this moss is in fruit however, it is most unmistakable! 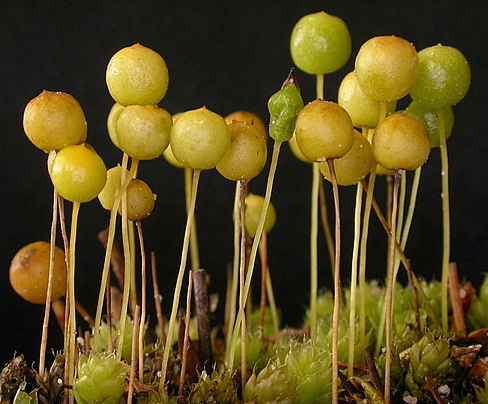 The green spherical capsules, which ripen a dull yellow-brown, are 3-6mm in diameter, and are possibly among the largest, if not definitely the grandest, of all mosses in Tasmania. These grand structures that gives the moss it’s specific epithet ‘grandiglobum‘ are borne proudly on long setas (or stalks). The capsules are cleistocarpous, a sophisticated way of saying that it does not open regularly through a well defined mouth, but rather, splits open irregularly at maturity. Precious little is known about the dispersal mechanism of the spores, much less on why the moss appears to be restricted to Buttongrass sedgeland habitats. 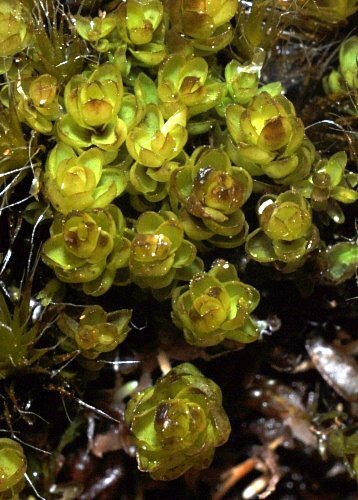 There are other reasons as to why the Globe moss is of such botanical interest. The distribution of the members of Pleurophascum are highly disjunct. One species P. ocidentale occurs in Western Australia. Another species, P. ovalifolium, occurs in New Zealand and was only recently determined by Australasian bryologists Alan Fife and Paddy Dalton in 2005 to be a different species from P. grandiglobum. 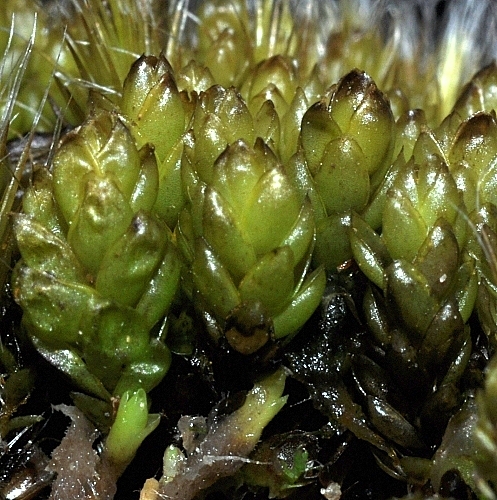 The affinities of Pleurophascum to other mosses are unclear. Bryologists have variously proposed that it is related to the Bryum (the Bryaceae) or Pottia (the Pottiaceae) mosses, but until more convincing evidence surfaces, it is best that the Globe moss remain in a family of it’s own, the Pleurophascaceae. If there should one day be an international exhibition of mosses, where every country were to submit a portraiture of a unique indigenous moss for exhibition, there can be little doubt that the Globe moss will be the prime candidate to represent Tasmania’s bryological heritage. As far as mosses go, the Globe moss puts Tasmania on the world map. This entry was posted in Biogeography, Botanical Heritage, Botanical History, Bryophytes, Key Characters, Plant Morphology, Tasmanian Endemics and tagged Bryophytes, buttongrass sedgeland, cleistocarpous, cleistocarpous mosses, endemic bryophytes, endemic mosses, Ferdinand von Mueller, mosses, Pleurophascaceae, Pleurophascum, Pleurophascum grandiglobum, Pleurophascum ocidentale, Pleurophascum ovalifolium, Robert Johnston, Sextus Otto Lindberg, von Mueller. Bookmark the permalink.